Hollywood snow is the best. You know, those big thick flakes that never seem to melt anywhere or turn a disgusting brown and then black as car exhaust fumes get them dirty? Yeah. Real snow ain’t like that. Last week, I once again had a snow day, even though there was very little snow in evidence. That’s the great thing about moving to the DC area from the Midwest. When I lived in the Midwest, snow days were rare and precious, not to mentioned hard-earned. Here, they happen at the drop of a hat. But hey, this teacher is not complaining! When my daughter got to the icy driveway, she just stopped completely and started crying. She was that petrified to walk to the car. But after some coaxing and the promise of truffles, she made her way toward her car seat. Yes, my daughter loves truffles. She’s only 4 and a half, but she eats everything, including salad. And dark chocolate is her favorite. Every year, she gets a rich, dark chocolate birthday cake. But I had to appease my other children, who prefer something lighter. 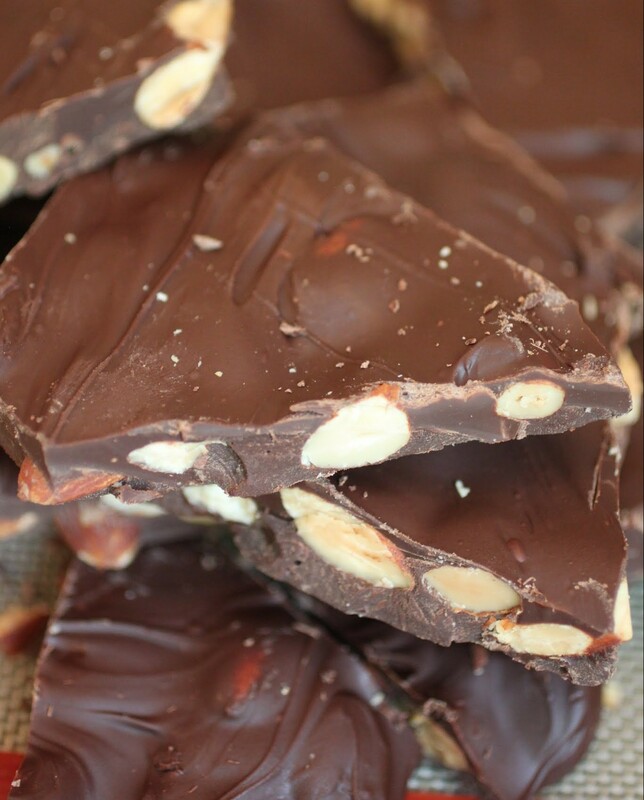 So I made these milk chocolate goodies instead! Truffles are easy to make, relatively quick, and a heckuva lot cheaper than what you buy in any store. All it takes is some cream, a smidge of butter, and milk chocolate. When you’re done, you have a plate full of rich truffles, perfect to eat while staring out at icy driveways. 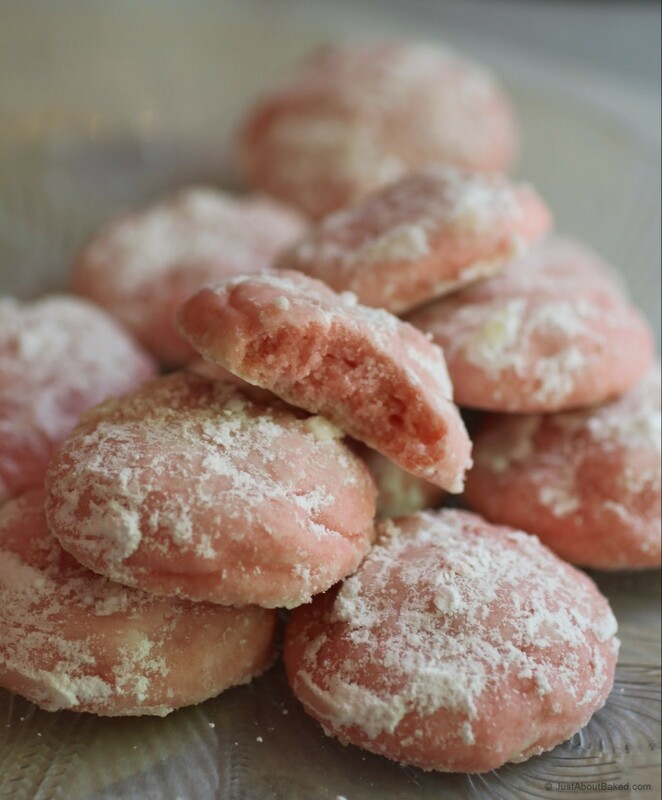 When these were ready to roll, I coated them in almond meal, which is just finely ground almonds. It comes in a bag at Trader Joe’s, or you can grind your own with a food processor. Either way, I am a chocolate almond addict, so this coating made me a lot happier than the classic dusting of cocoa. It added an extra something to the flavor, too! The truffles are definitely better chilled, at least, in my humble opinion. They get fudgier and denser. Essentially, these truffles are a thicker ganache, so one will probably go a long way toward satisfying any cravings. That is, until the next snowfall. 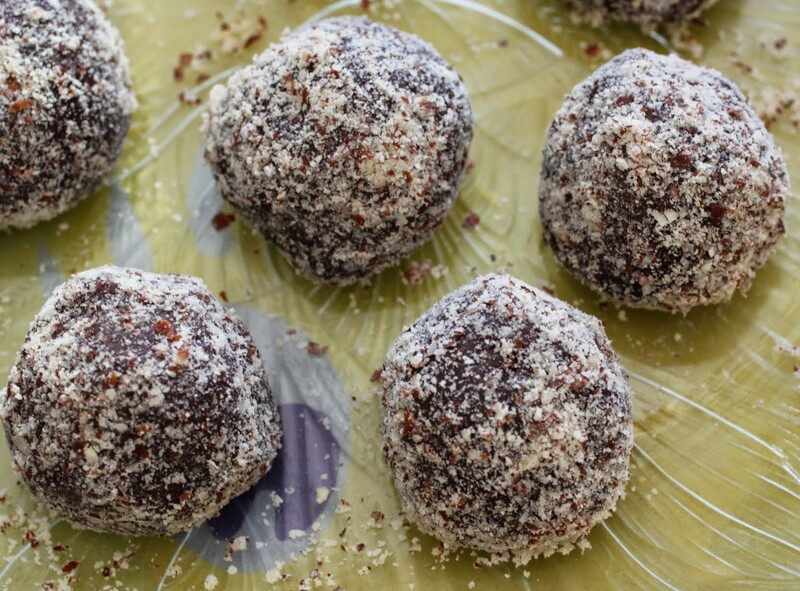 There’s something about truffles and snow that just goes together, so whip up a batch and keep them handy for inclement weather. Or hey, if you live in a more temperate climate, that works too! Just think how lucky you are not to be driving through icy streets and dirty snow. But you know, a snow day is still kind of magical. And a snow day with truffles is perfection. Savor the moments! In a saucepan, heat the cream until it's moving at a healthy simmer. Add the butter and stir until melted. Mix in the chocolate, stirring until all ingredients are melted and smooth. Remove from heat. When the saucepan is cool enough, put it in the refrigerator and chill the truffles for at least 4 hours, though overnight is preferable. When you're ready to roll, put the almond meal in a small bowl and take the saucepan out of the fridge. Working quickly, roll the truffles into balls. They'll be a little sticky. Immediately immerse them in the ground almonds and set on a plate. Repeat until done. 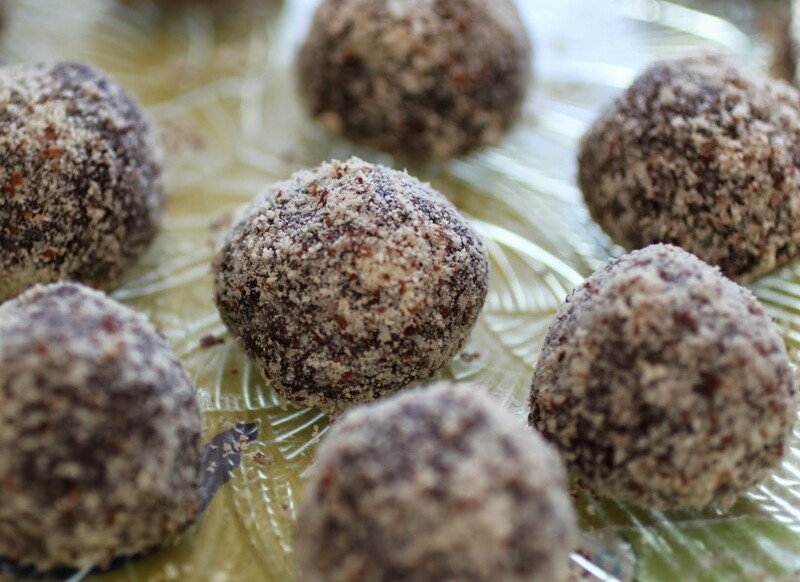 For best results, store the truffles in a container in the refrigerator for up to one week. Hang on, kids. This is gonna be one heck of a ride. Sometimes I don’t have to do any thinking. The wonderful food manufacturers do it for me. And I love them for it! This past Sunday, I was embroiled in our weekly grocery trip. Translation: I was hoisting my 2 year-old on one hip, dragging my 4 year-old by the hand through the aisles, and snapping at my 6 year-old to stop touching everything he saw. That’s why I prefer to shop alone, but whatever. It’s usually not an option. 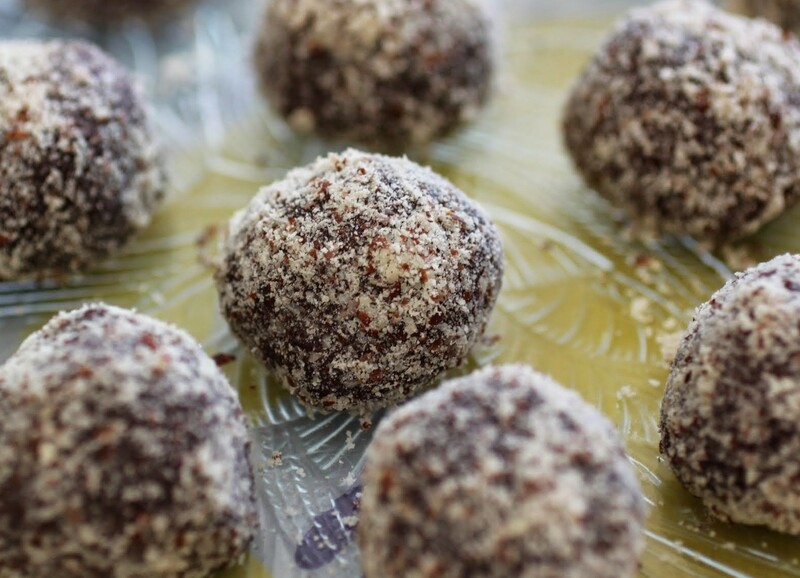 I think these truffles would get me to go just about anywhere, too! I love how easy these are to whip up. And the almond meal coating sounds like the perfect topping. Sounds like the perfect sweet treat to me! Thanks, Gayle! Anything almond is my happy place! I love that you have used almonds to coat the truffles. I usually use coconut, but I love this idea. I can eat so many truffles it’s crazy. Coconut is great too, Dannii. I’m just a huge almond fan. I can eat a ton, too! 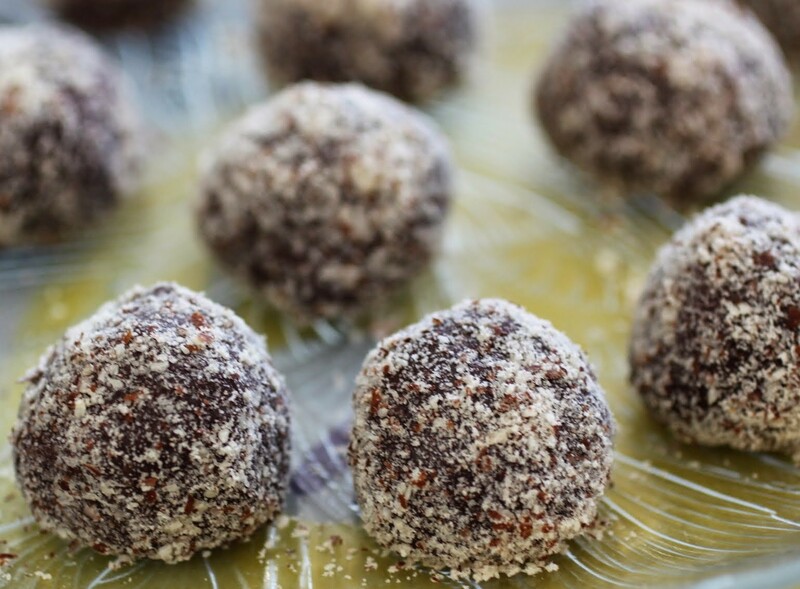 I love truffles so much and every time I make some at home, I end up eating most of them, just don’e want to share 🙂 The almond meal coating sounds awesome! Pinned to try them! Thanks, Mira! I freeze them so I eat them slower, but yep, they get eaten! Mir, oh my goodness! I was just talking about this this morning with a friend. I live in Wisconsin and we got like a foot of snow yesterday and of course, this morning, we still have school. It’s like school goes on, even when it’s like 8 degrees outside but in TX or anywhere else, if it snows like 1 inch, everything is cancelled. ok, I’m exaggerating a bit but you know what I mean! I hope your daughter (I have a 4 year old too!!) enjoyed these truffles!! I love that she loves dark chocolate! Oh my goodness, I love that your little one stopped crying with the promise of truffles!! Of course her mama is a food blogger! I’d stop anything for these truffles! 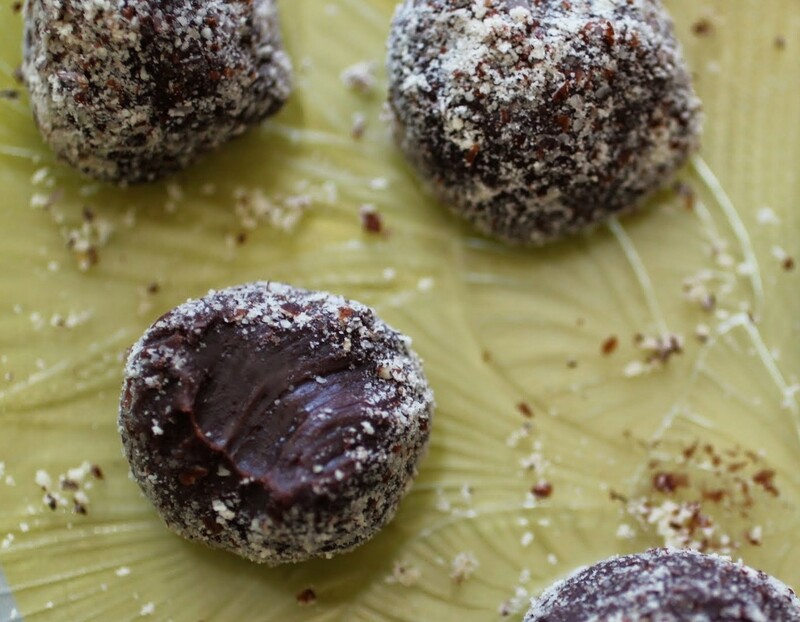 Oooh I love how simple and delicious these truffles are, and they sound perfect rolled in almonds! They are totally easy, Rachel! The fewer ingredients, the simpler and not processed. I’m all for that! so yum, loved that you rolled them in almonds! Almonds are my love, Manali! Along with every other kind of nut. And chocolate. Oh my god I AM MCPS! What a small world. And yes, totally. Last Tuesday was a gift, the weather was fine! Okay, I teach at Blair. Tell me you’re not at Blair. That would be crazy. Nooo I go to Whitman (go Vikes) That’s still crazy though! Totally crazy. I used to teach at WJ. Go MoCo! Mir, I know what you mean about the snow days! I grew up in Pennsylvania and we almost always had to go to school no matter how much it snowed — which was a lot! I moved to North Carolina and the whole state shuts down with one snowflake. I love it! These truffles look delicious and I agree with Medha. That picture of the one you took the bite out of makes me wish I had some right now! Whenever I do the bite shots, it’s hard not to keep going and take about 5 more bites. Even for the five minutes of photo taking! Way to go, moving to NC. Warmer AND you get snow days! I’ve never made chocolate truffles before. 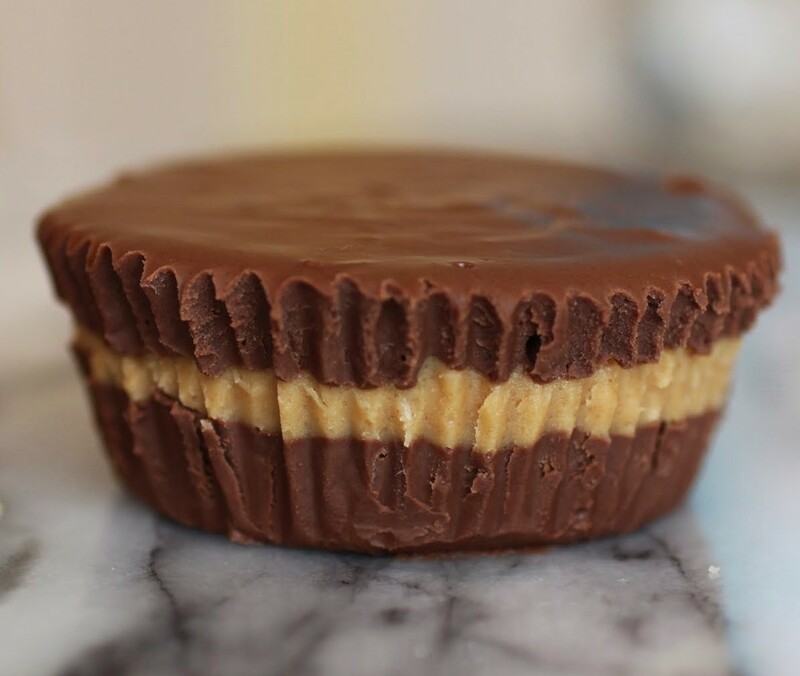 These look absolutely amazing though, so I certainly need to try making them soon! They’re so easy, Stacey! Try it!